On Monday, 27 March the eager walkers were greeted with a clear sky for Day 2 of the Karkloof Catchment to Confluence River Walk. We were thrilled to have Hlengiwe Ndlovu, an environmentalist for Sappi, join us for the day and share her expertise and knowledge with our team for this vitally important project. The team were dropped off at the same point that we ended at on the previous day and started a new Riparian Health Audit (RHA) to measure the quality of the upcoming river stretch. A miniSASS study along with water chemistry tests were also conducted. The journey along this first RHA section yielded a “Fair” result, which had been the lowest score we’d gotten since the source of the Karkloof river. We anticipated that the results would show a decrease in river health, as we had come across the first sign of humans since starting on our walk. Hlengiwe Ndlovu (SAPPI) was thrilled to walk along the Karkloof River with us. This RHA area was badly infested with Wattle and Bramble; there were signs of litter and small scale dumping; and Ayanda Lipheyana of GroundTruth pointed out the “Sewerage plant” which grows along river banks where there is a high nutrient load in the water. This warranted a sample to be taken for E. coli, Nitrate and Phosphate tests to be done. These samples are sent daily to Talbot and Talbot who have kindly donated their time, equipment and expertise for this project. A portion of the Bramble infestation. We soon entered Plantation territory, where the team were treated to interesting stories from Hlengiwe about the challenges they face when planning Invasive Alien Plant control within the plantation areas. This walk has inspired some valuable discussions while sharing thoughts and ideas. The team were impressed with the progress that has been made by SAPPI in the stretch we were walking for the day. Appreciating the healthy looking riparian zone between the two plantations. The riparian zones were looking healthy and we had an easy walk through the grasslands, appreciating the lack of bramble hooking onto our clothes and skin. Hlengiwe pointed out the Bracken in a few areas, telling us about the nightmare in trying to control this pioneer species. This plant is a common sight in the KZN Midlands, turning a beautiful golden brown colour in the autumn. There was a consensus in the discussions between the team that the most effective way in controlling the spread of this plant is to keep it short and cut the regrowth at its early stages. Hlengiwe Ndlovu (SAPPI) pointing out the Bracken that proves difficult to remove. As the team saw their homestretch to the end of day 2, Ayanda’s foot managed to find an animal’s home on the grassland slope, unfortunately twisting his ankle in the process. One of the dangers of walking through unpathed areas. Ayanda getting his ankle strapped by Nduduzo to help him reach our end point at the bridge in the background. Our sincere thanks to all sponsors and landowners who have made this walk and study possible. So far it has proven to be an extremely valuable exercise and we look forward to the rest of the journey. This entry was posted in Alien Invasive Species, Conservancy Action, Water, Water Stewardship and tagged catchment to confluence, custodianship, karkloof, karkloof river, karkloof river walk, miniSASS, water on March 29, 2017 by Midlands Conservancies Forum. Pom Pom Weed Campuloclinium macrocephalum is one of the emerging weeds that we have to keep a sharp eye on in the KZN Midlands. This picture was taken in Dargle this week by local eco-activist, Eidin Griffin who reported it to SANBI. If you spot any plants, take a photo of the location and record the GPS co-ords if possible, and email V.Mkhize@sanbi.org.za. An eradication team will come and remove them. Description: Erect, perennial herb with fluffy pink flowerheads. Stems green to purplish, up to 1.3 m high, dying back annually to a root crown. Leaves are light green, scattered along the length of the stem but clustered at the base to form a rosette, up to 80 mm long and 20 mm wide, margins are serrated. 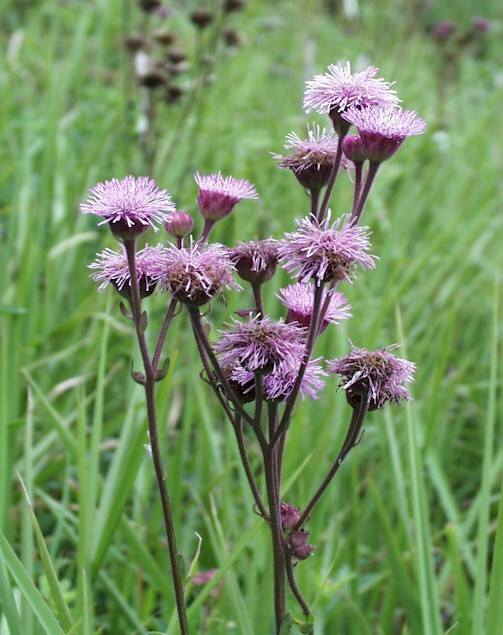 Flowers light purple to pink compact flowerheads that are situated terminally, flowers December-March. Distribution: Native to South America (Argentina and Brazil), Central America and Mexico. In South Africa it is emerging in the following provinces: Mpumalanga, Limpopo, North West, KwaZulu-Natal, Eastern Cape and Free State and established in Gauteng. How it spreads: Produces fluffy seeds that are wind dispersed. People contribute to spreading the seeds through carrying them in the mud on their vehicle’s wheels or by picking and discarding the mature flowerheads and thereby spreading the seeds. It can also regenerate from underground rhizomes. History in SA: Pompom weed was introduced in South Africa as an ornamental plant. The earliest record in the Pretoria National Herbarium is of a specimen collected in Johannesburg in 1962. Currently it is most prominent in Gauteng. The earliest record of its establishment in the wild is from Fountains Valley, Pretoria in the early 1960s and Westville near Durban in 1972. In the 1980’s its distribution expanded in the Pretoria area, and it was also recorded from Hilton in KwaZulu-Natal and Wolkberg in Limpopo Province. In the 1990’s it spread further to Port St Johns in the Eastern Cape, Rooiberg in Limpopo and Nelspruit in Mpumalanga. From 2000 to 2003 it exploded in Gauteng and in the Free Sate the first record was in Kroonstad. During the same period there was much spread in the Nelspruit, White River and Barberton areas. By 2006 it had spread to the Piet Retief area in south-eastern Mpumalanga and Swaziland. Environmental and Economic Impacts: Threatens the survival of grasslands and wetlands throughout South Africa as it can tolerate a wide range of habitats. It transforms the landscape from green to pink in summer. How to eradicate: The only herbicide registered for use on pompom weed is Brush-off by DuPont. The two physical methods including uprooting and burning of the plant. Bio control is currently under investigation. For a guide on herbicide application contact us on the details below. This entry was posted in Alien Invasive Species, Environmental Issue and tagged invasive plants on January 20, 2014 by Midlands Conservancies Forum.